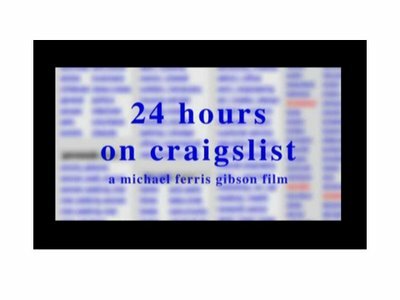 Click here to watch "24 Hours on Craigslist"
"I first experienced Craigslist in 1996- I posted for an editor for my first feature and received over 250 responses. I knew I had to make a movie of this phenomenon. I wanted to figure out the right angle. A random day, and a crew found entirely from Craigslist!" "Anyone interested in voyeurism, the internet, new social norms, or just finding out the truth about what people are REALLY doing on the internet at 3:15 in the morning." "It's great to spread the gospel of the free, open, community service that is Craigslist. But I'd like people to understand some of the dangers lurking out there, including the issues and self-destructive tendencies that might arise from one's own ego when exposed to this new and empowering technology."